Let me set the scene. 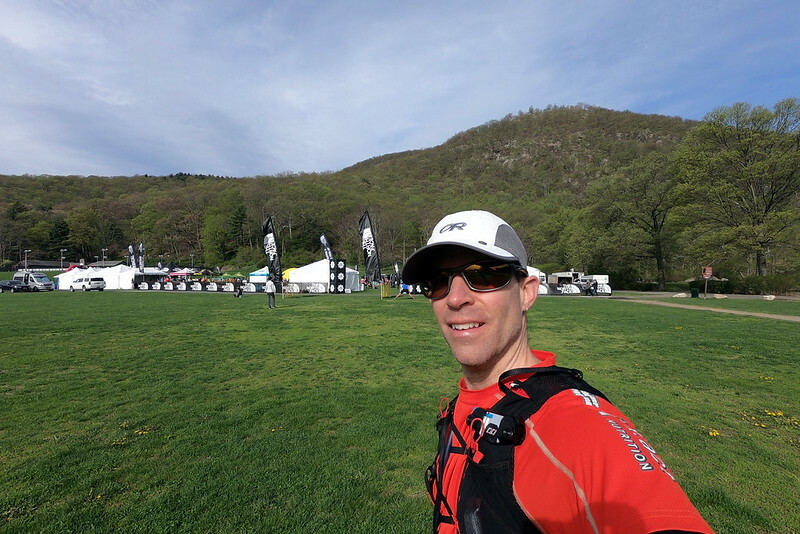 We’re talking about the North Face Endurance Challenge, Bear Mountain 2018. I was originally registered in the 80k race, dropped to the 42k race two days before race. The odds were stacked against me even participating in this race. Roughly 2 months earlier, I had a full ankle lock-out, necessitating x-rays and a self-funded MRI to expedite results. Verdict was fully torn ligaments (3), as well as ‘loose bodies‘ (one 5mm in diameter, the other 8mm, with more possibly hidden…) which were the likely cause of my locked ankle, and reason I’m currently awaiting surgery (sometime in this decade I hope!!). In addition, the past 2 weeks, I’d been extremely sick with bronchitis (avoided doctor and antibiotics until the week AFTER the race). However, given that an orthopedic doctor had cleared me to ‘run’ two weeks prior to race, I decided to go ahead and give things a whirl. Yes, saner people may have thrown in the towel, but I figured worst case, I’d hike my way through the course. Read on to hear how it all went down. I’ve got pretty big trail running plans for 2018. 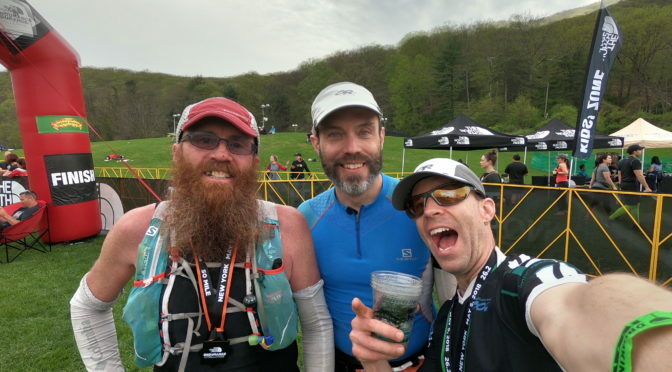 Later in the summer I have my ‘trilogy of pain’ in the form of Quebec Mega Trail (100k, 4,200m climbing), followed 4 weeks later by the Canadian Death Race (125k, 5,100m climbing), capped off 4 weeks after that by CCC in Chamonix, France (101k, 6,100m climbing). As such, Bear Mountain was supposed to be a kick-off and level set for my season. Unfortunately, it actually turned out to be my first trail run of the entire year. I’d gotten out exactly twice leading up to it, both on roads and flat (thanks bronchitis!). However, in my soul, I NEEDED this event, regardless how it went. After 6 weeks of no running, I realized the fragility of what we do, and decided that if I COULD locomote, I WOULD. For now. With this in mind, I linked up with a couple other local runners for the rather long drive down to Bear Mountain. It was my 3rd time racing there, and 1st time at this distance. The terrain is quite tough, definitely ankle rolling territory with a seemingly limitless supply of rocks ready to trip you. So, with a really bad food, and really bad lungs, I strapped on two ankle braces, plenty of fluids, a camera, and decided just how well I might be able to suffer through the event. 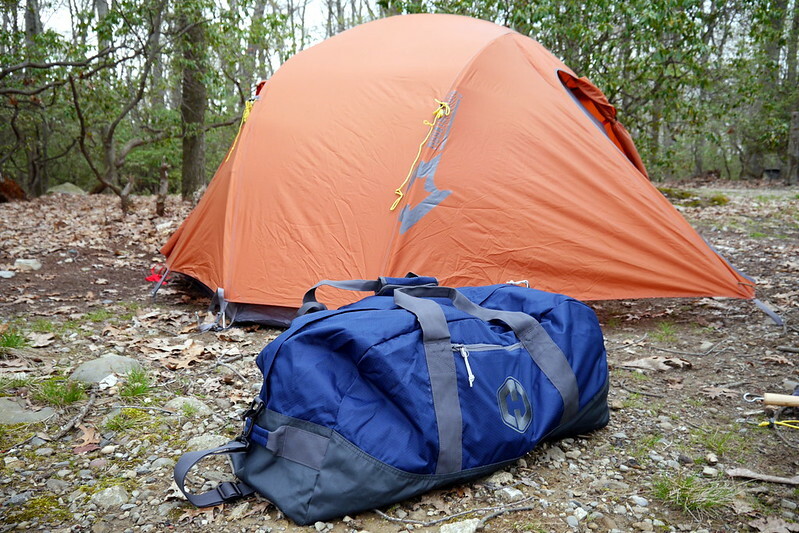 The night before and night after, I’d be camping in my tent solo, so it was a real ‘down to earth’ weekend, stripped of any luxuries, including cell coverage. It was me and my frailities against the trails and my own psyche. Exactly how I wanted it. Even though I wasn’t officially covering the event for any media, I did take video of the experience, a quick summary of which you can watch at the end of this report (or just scroll to the bottom now if you don’t feel like reading all this…). My entire mental process surrounding this race had two key tenets. First, I was relying on residual fitness from a very good winter of cross country ski racing. I’d had my best results in years, so I had the ‘engine’. Secondly, I had mental toughness on my side. You never know what you can do until you’re up against the ropes getting beaten down. After years of long endurance events, I knew I could mentally push through, even if it meant hiking large swaths of the race. With those thoughts in mind, I was excited to see that the weather had shaped up perfectly. I lined up in the 4th wave (of 5), in a spot that guaranteed I likely wouldn’t be under too much pressure to go fast off the start. The plan was to keep a steady pace, watch my step, eat, drink, and HAVE FUN! The problem is that very often, having fun means chasing people down and pushing too hard, so it was a delicate balance. One that I got wrong right off the bat. The opening 2 legs I’d say I went a wee bit too fast. I should have realized that as I worked my way through pretty much the entire 3rd wave and most of the 2nd wave as well. I was running carefree through the woods with a good little group of folks who were hooting and hollering, running great, and having fun. We traded spots, even on the tricky downhill bits, and I was enjoying the flow. They had a few reservations running near the dude that could scarcely breathe at times and would explode into thunderous coughing fits as he ran (i.e. ME! ), but overall, things were great. Cruising into that 2nd aid station though, I realized I should lighten up my pace and run my own race. The first 16k or so always feel easy, but having not run AT ALL this year was about to take its toll. I started leg 3 on my own, and tried not to get too carried away when people wanted to pick up the pace around me. Had some groovy conversations with people a bit incredulous of my running given my circumstances. I also think I annoyed a few people that I passed. When passing, I’d apologize for not being talkative, since I had the flu. I’m guessing they didn’t like being passed uphill on a hard section by a person who was coughing up a lung!! However, I did also have a few great chats with other people, including another dude who offered to share his puffer with me, as he had ‘walking pneumonia’ and was in a similar state as me. I declined, but wondered if that might have helped in some sections! Salbutamol anyone? The weather stayed magnificent overall, with temperatures staying in the high teens and low twenties as we ran (that’s of course Celsius, folks). Humidity was low, but the bugs were out in force. If nothing else, it made you want to run faster and keep a decent pace! I picked my way through the various checkpoints, always taking the time to drink a fair bit. I noticed my food intake was pretty low, but I figured that over a 42k course, I really shouldn’t need to eat too much. The other positive of this race was that I [somehow] managed to avoid further damage to myself. The two braces were doing their job, and although I slightly rolled my ankles a couple times, there were no major traumas to speak of. In the past on this course, I have had major sprains, and I really didn’t want to risk that this time around. Although I’d driven down with friends, they were in other races, and there was no one supporting me in this event, so I will admit it was a bit lonely not seeing Deanna at all throughout my race. It’s always nice to see a familiar face. In spite of that though, the on-course volunteers were great, and tended to my needs quite nicely. All in all, the 42k course follows much the same terrain as the other races I’d done down here, up until the last section. There was a large climb I remembered from other years that didn’t show up on this course. However, on the flip side, when I came to the area where I expected us to basically run downhill to the finish, my race was routed off to the right to tackle another section, consisting of a long downhill run to the water, then a climb back up. So that was a bit of a gut-punch when I was feeling it would be nice to finish. 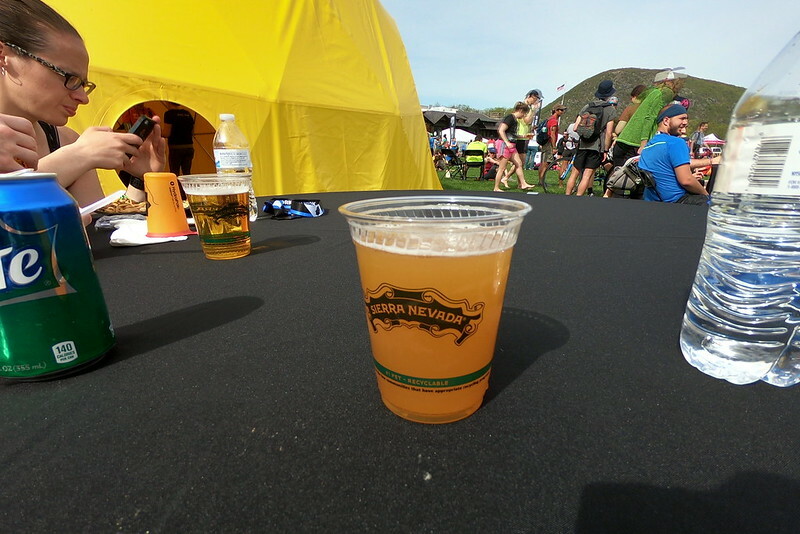 After all, I was looking forward to the post-race Sierra Nevada beer (or several) that I’d get to enjoy. We capped things off by heading back to the campground to rest up before the long drive home. The next morning it was ‘eat all the things’ time, and we stopped at an IHOP (or is that IHOb now?) to load up on breakfast. So very tasty. Unfortunately, it had rained really heavily overnight, so packing up had been a pretty soggy situation, so upon getting home I had to unpack EVERYTHING to dry it out in the basement. Despite that, the weekend was a success of sorts. Time to rest up and get ready for my next race that was in 2 weeks! 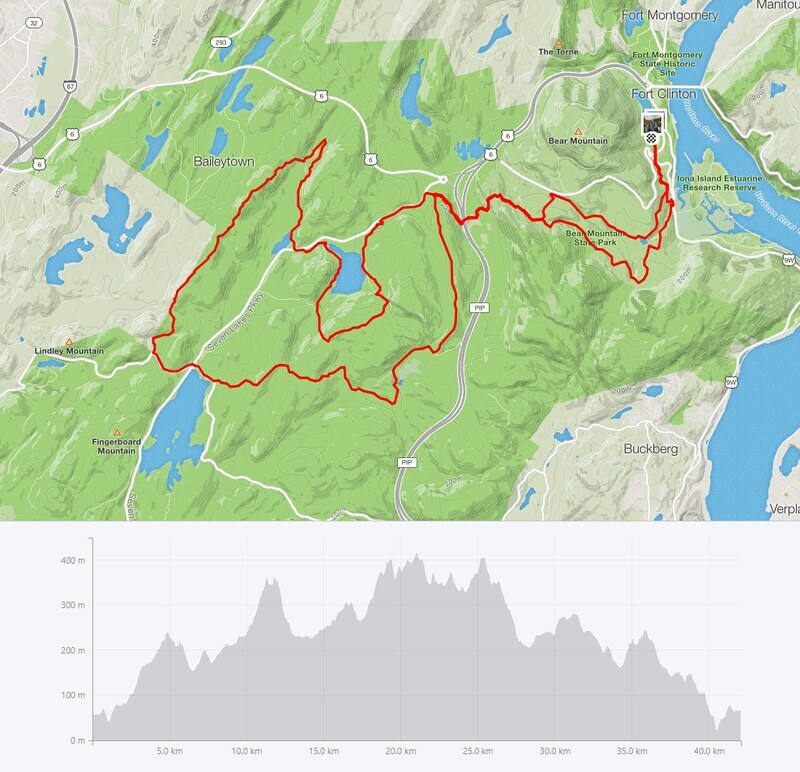 An 8 hour adventure race. Stay tuned for that report and full video! Till then, be thankful for what you have, and get out there every chance you can! !